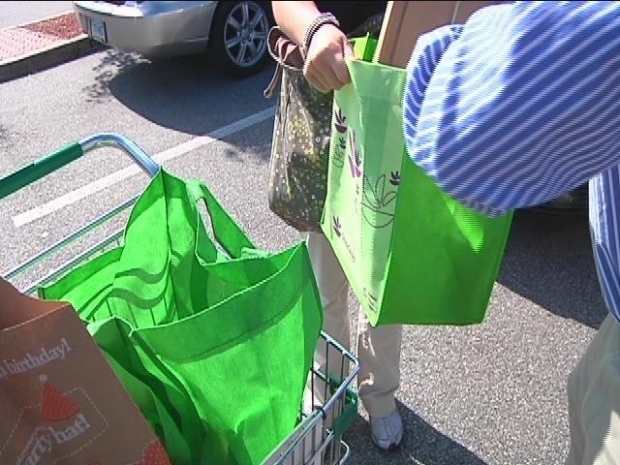 The reusable bags many of us use when we go to the grocery store are good for the environment, but they might not be good for your health. Many of us never think to clean them, which means we’re toting a lot more than groceries. It got us thinking and we decided to put bags to our own test. We collected several bags from shoppers at random and tested them, The results we found were gross. "They were very, very germy. Some bags were definitely worse than others," said Dr. Rolf Knoll, the chief medical officer at St. Francis Hospital. Reusable bags can carry more than just your groceries. Technicians used swabs to test five bags for bacteria and one of them tested positive for fungus. Others had dozens of colonies of bacteria inside. "Specifically we found diphtheroids, bacillus, staph epidermidis," Dr. Knoll said. In layman's terms, it's the same stuff you'd find on a dirty countertop. "I've never washed them before. That's a really good point," said Marzena Mocarski, of New Britain. But researchers at the University of Arizona and Loma Linda University recently did a similar test using 84 bags from shoppers in California and Arizona and more than half the bags they tested contained some sort of coliform bacteria, including e-coli. "People just use them over and over again and it's a bacteria catcher. It's a health hazard," Rich Sabonis, of Ellington, said. Doctors recommend washing your reusable bag or wiping it out with bleach after each use. "Even more importantly, wash the food that comes out of them before you eat them. That's the most important thing," Dr. Knoll said. It's advice many shoppers told NBC Connecticut they'll take. "Yep, I'll definitely wash these bags from now on," Allison Regan, of West Hartford, said.